The most difficult and discouraging time you’ll encounter when learning an instrument happens right at the beginning. There’s so much to take in that it can seem mind-boggling. There are fingerings to learn that just won’t happen naturally and practice can appear to drag. It can seem bad, but don’t worry, these are just teething troubles and they’ll soon pass. Possibly the worst problems you’ll encounter will be physical. Your fingers will have the kind of workout they’ve never experienced before, as you force them into shapes and movements that can seem unnatural. They’ll ache, but that’s perfectly normal and it will stop quickly. However, make sure you don’t overdo things. Take it slowly at the start. 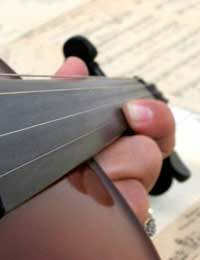 If you play strings, you’ll find that the fingertips of your left hand (assuming you play right-handed) will become very sore from pressing down the strings. Again, don’t worry; this is perfectly normal. Your fingertips need to harden and develop calluses. Until you get them, don’t play for too long at a time; over do it and you can end up bleeding. Posture can be another big problem. Your teacher will show you the best way to sit in order to play your instrument. Pay attention, because it can save you a lot of backache later. It’s all too easy to slump forward in order to see what you’re doing, and that’s not good. Regardless of your instrument, you need a straight back. That’s especially true with wind or brass instruments, where breathing is important. If you play wind or brass, your lips are going to feel funny for a while as you become used to the embouchure. That’s part of the learning process, as your teacher will explain, and as with all the other problems, it will fade as you become more familiar with the instrument. Although many of the problems you’ll face initially are physical, there are the mental aspects too. In the early days of learning an instrument you take on a lot and it’s easy to feel overwhelmed. Break things into small pieces and master them at your own pace. There’s no need to rush; in fact, if you try you’ll only become more frustrated, as co-ordination takes time to develop, especially on an instrument like piano where the hands work independently. A good teacher will introduce new things gradually, giving you plenty of time to master what’s gone before. Not doing that can greatly affect your confidence. You need to feel assured, especially in the beginning. Don’t practice too much when you’re still a novice. It can seem appealing as a way to learn quickly, but all too often the opposite can happen. Frustration can set in when your fingers won’t do what you want, and that can lead to you giving up the instrument. Take it slowly. You teacher will advise you on practice times – listen to him. Accept the fact that you’re not going to learn everything at once. You’re starting a journey that will take years. Yes, you have to work at it, but it will also give you plenty of satisfaction along the way. There’s really no hurry at all.